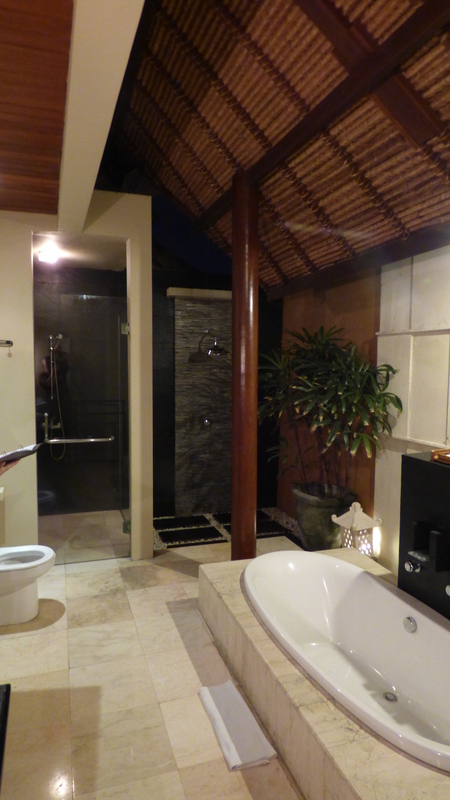 It’s travel time again and on this occasion, Roger and I decided to see what all the fuss was about in Bali. Since so many Aussies visit there every year, there’s gotta be something worth seeing right? Although, if I’m entirely honest, I wasn’t particularly hopeful and I had mentally and physically psyched myself up to deal with the very worst that Bali could throw at us. As a holiday destination, Bali gets a bad rap from the Australian media and we decided NOT to watch the Today Tonight special edition on the eve of our departure which boldly claimed in its trailer that week: “1 AUSTRALIAN DIES EVERY 9 DAYS IN BALI.” No, best not to watch that sort of thing before one leaves for the destination! So having spent the last three days stocking up on Cascade red cordial (a precious liquid that supposedly stems the onslaught of Bali belly), cod liver oil tablets, vitamin C tablets, hayfever pills, Berrocca tablets (aids in repelling mosquitoes), and anything else that we had heard/read about, we were almost ready to go. The final things to be packed were the Mozzie bracelets, Aeroguard roll on, Dettol hand sanitiser and the dia-stop pills (to “blog us up” should the red cordial fail). Let the holiday fun begin! After a very leisurely drive from Midland to Perth International, the best of Wayne Fontana emitting from the taxi radio, we arrived at check in. Having been appropriately sized up by the check-in attendant, she deemed us fit and able enough to assist with any air emergencies that may arise (excluding of course the disappearance of an entire jet plane) and allocated us the front row exit seats on our Jetstar flight. Chuffed to bits to still be considered to look ‘youthful and agile’ , we confidently boarded the plane and in no time at all (3 1/2 hrs), we’d arrived in Bali, Indonesia! Too easy! And no time zones to deal with either. It was when we arrived at Denpasar Airport that things began to go a little awry. It’s been so long since I traveled, I had forgotten that many small, older Asian women have no understanding of personal space! The queue to customs was atrocious, and we ended up in the ‘slow lane’. It didn’t help that we were approached by someone who offered to ‘express’ us…..and I politely sent him away. I thought he was offering me a taxi. However, Roger had been informed by his workmates to jump at the offer if it was made (which was purely random and very rare! 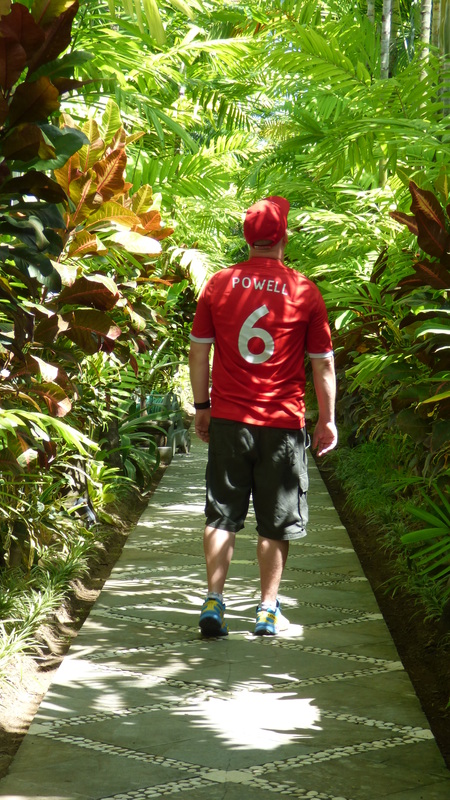 ), explaining that the official walks off with one’s passports to return 5 minutes later to happily lead you past all the the chumps sweating in the Indonesian humidity of the mile long queue. After 45 minutes of barely moving five metres, and the aforementioned small, Asian women practically riding on my back in the queue (also whilst chewing her gum louder than a cow does its cud! ), I was cursing my cautious nature. 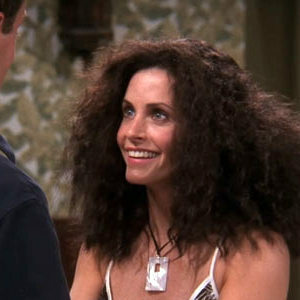 In addition to that, the humidity had dramatically increased the volume of my hair ten fold and I was now sporting a very un-stylish “Monica.” (I am referring to the episode of Friends when they travel to Barbados). BUT, as I whined apologetically to Roger, his blue Jeep t-shirt clinging to his sweaty frame, and what I still stand by; you should NEVER let your passport out of your sight when traveling! Traffic was, as we expected, organised chaos, and thank the lord we had the foresight to be arranged to be picked up. 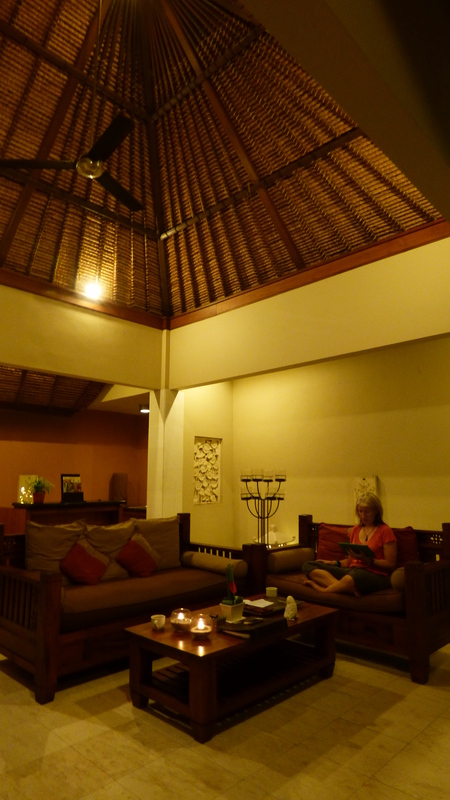 We joined the Bali vehicle opera for 45 minutes before finally arriving at Bhavana Villas, Seminyak. On check in we were greeted with a cool glass of orange juice which we knocked back immediately, letting the ice cubes clink together as we thirstily drained the glass. Uh oh…Ice cubes! That’s what “did it” for us in Thailand, and we hoped like hell that the red cordial would live up to its reputation! Did I mention savvy travelers anywhere above? Nope? Good! Having checked in, we were escorted to our villa, (Number 1 as it happens) which by all accounts was truly spectacular: the tranquil pool lit from every angle, the traditional wooden Balinese furniture that decorated every room, the smell of incense and the beautifully turned down four-poster bed draped in white mosquito netting. I sighed with relief. It really did look as amazing as the pictures on the website. We were especially stunned (is that the right word?) 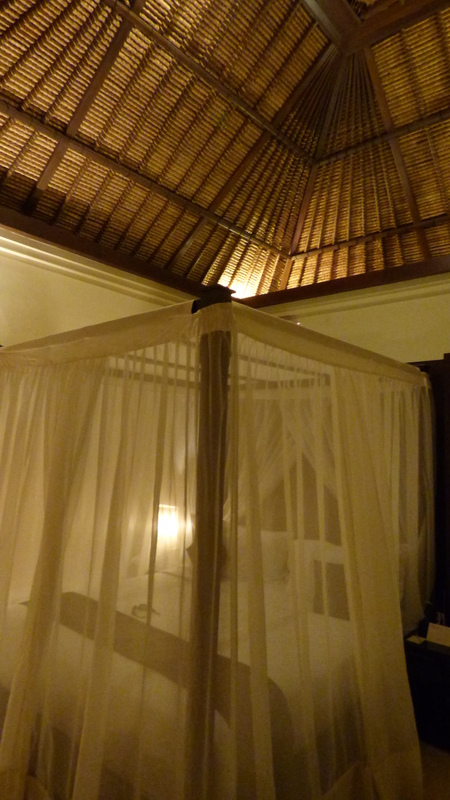 by the fact that, apart from the sleeping quarters, everything was open to the natural environment, in true Balinese style…… a million trillion mosquitoes baying for fresh blood included in the package. Here’s hoping the money spent on roll-on’s, bracelets and tablets will repay us in kind. 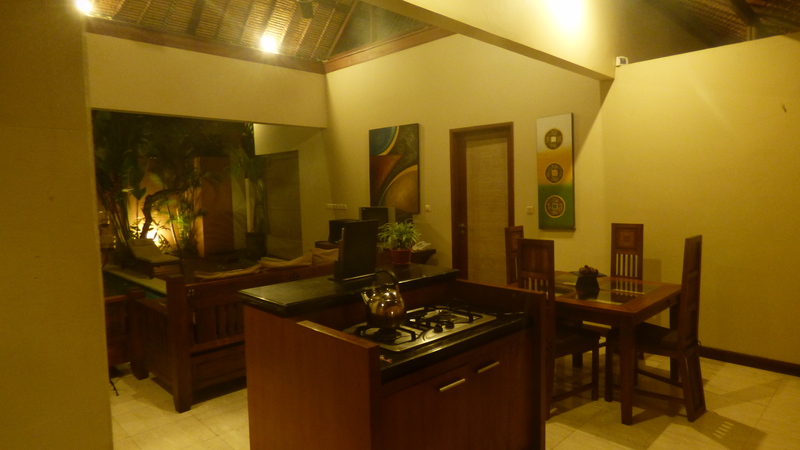 Had we realised our villa was mostly entirely outdoor living, we would have invested in a bracelet for every limb! 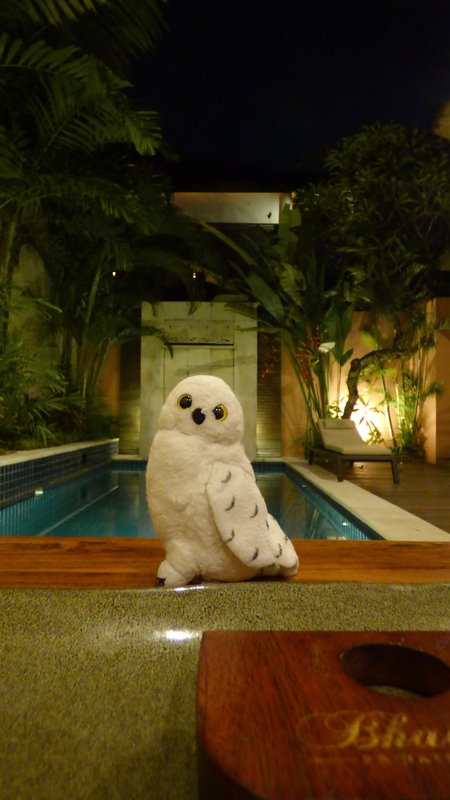 Owlface relaxes by the pool. So having smeared a few extra lines of Aeroguard across our virgin skin, and having become accustomed to the skinks coming out from behind the paintings/plants and skittering all over the walls of the bathroom and living areas, we were officially settled in and awaiting our personal butler to arrive with dinner: fries, bruschetta, one beefburger, one chicken burger and one carton of cow’s milk. After some dinner and a not-too-bad cup of English Breakfast tea, we dove into the safe confines of our Mossie net. Being too warm to sleep under the covers, there was nothing for it but to sprawl on top – bare, white Aerogaurd-free flesh exposed for the hungry Mossies who had managed to flit in through the doors behind us. Ahhhh, what a feast they would have tonight….